Fourth edition of this Heidelberg poster competition. 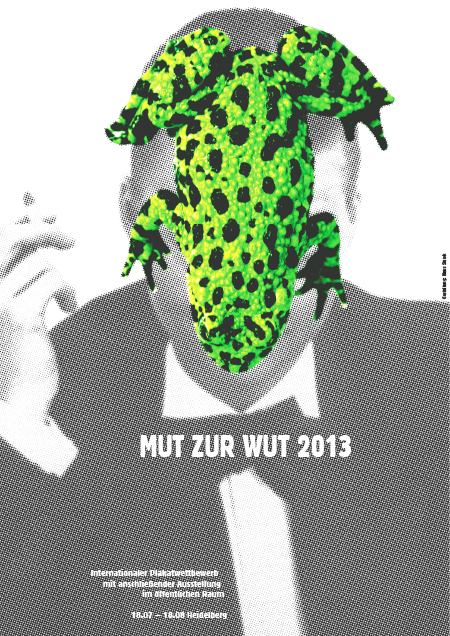 Above: Klaus Staeck poster for Mut zur Wut 2013. The call for entries for the fourth edition of this Heidelberg-based international poster competition went out on April 1, with a deadline of May 31, 2013. Originally founded by Götz Gramlich, this competition receives entries from all over the world and has blossomed from it’s original inception and now represents a truly international projection. Selected posters are exhibited in the streets of Heidelberg but have also traveled beyond in recent years. Thematically unchanged, this competition challenges designers to address compelling issues that challenge the general public and perhaps even provoke a response. Entry rules and details can be found in three languages at Mut zur Wut 2013 and you can also follow along via their Facebook page. PAGES / FORWARD OR BACK? Occupy: What’s next? A call for posters. This entry was posted by Erik Brandt on Wednesday, April 17th, 2013 at 12:56 PM	and is filed under Aktuell, Education, Geotypografika, Graphic Design, International, Internet, News Links, Typografika, Typography. Copyright © 2008-2013 by Erik Brandt, unless otherwise noted. All rights reserved. Please use Firefox. Powered by WordPress. Modio theme by Robert Ellis, modified by Jasio Stefanski.